Pakistani troops resorted to heavy shelling and firing on Indian posts and civilian areas along the LoC and international border in Jammu, Kathua and Rajouri districts on Friday, taking the number of ceasefire violations by Pakistan to over 56 post the surgical strikes. The victims — two girls and a man — were injured due to mortar shell splinters in Lallai Chak village on Friday. The cross-border firing on 24 October led to the death of a six-year-old boy and a BSF jawan, injuring 10 people, including eight civilians. Pakistani troops targeted over 25 border outposts in the border hamlets along International Border using small and automatic weapons as well mortar bombs in the border areas. The troops again violated the ceasefire on 25 October where eight civilians were injured in shelling in RS Pura and Arnia sectors. 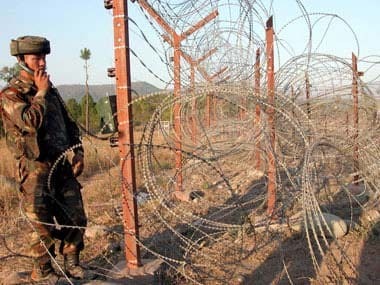 On 27 October, a BSF trooper was killed and seven civilians were injured when Pakistani troops shelled over 15 Border outposts and 29 hamlets with mortar bombs and fired heavily from automatic weapons over the night in Katgus sector of Jammu which further spread to Hiranagar and Samba. The ceasefire violations have only increased since the surgical strikes which were carried out by Indian Army on 29 September on terror launch pads in PoK, in which four persons, including three security personnel, died and over 25 were injured. The Army has constantly been on alert, and have been advising people to stay indoors as firing continues across the Line of Control. The indiscriminate mortar shellings in Lallai Chak, Pansar, Pahadpur, Londi villages and other places along the LoC have damaged over two dozen houses compelling more than 400 families to migrate to safer locations. Over a dozen cattle have also perished in these villages. The entire population of Abdullian village in RS Pura sector has also migrated after Pakistan Rangers targeted civilian and BSF facilities in the area during the last five days. Authorities on Friday imposed curfew in parts of Srinagar in view of the separatists' call for a march to the historic Jamia Masjid here ahead of Friday prayers. Curfew has been imposed in Nowhatta, Khanyar, Safakadal, Rainawari and Maharaj Gunj in the old city and Batamaloo in uptown, a police official said. As many as 85 people, including two policemen, have been killed and thousands of others injured in the ongoing unrest in the Valley. Around 5,000 security forces personnel have also been injured in the clashes. Over 300 persons have been booked under Public Safety Act.